Cheng Yin, 20, studies general finance at a university in Queensland, Australia. Her parents are satisfied with everything at the university, except her classmates. About 30 students take the same classes, and 12 of them come from China. "I do not have any bias against Chinese students, but I am really worried about her English because she stays with Chinese classmates day and night," complained her father, Cheng Wenbin, in Shenzhen, Guangdong province. "Honestly speaking, I don't have big hopes for my daughter in the financial field. What we thought is, send her to study in an English-speaking country and, after several years, at least she can speak fluent English when she comes back," Cheng said. "But now, I doubt it." The Chengs are not alone. "Our finance department has 200 students, 50 of whom are Chinese," said Cai Shuang, who is from Jinan, Shandong province, and is pursuing a master's degree at City University, London. "I like to sit with the Chinese in class and many other Chinese students feel the same way. 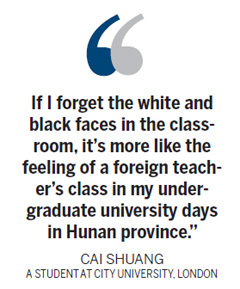 "If I forget the white and black faces in the classroom, it's more like a foreign teacher's class during my undergraduate university days in Hunan province," she said. The number of Chinese students who seek further education abroad increases each year, so it is only natural that classrooms have more Chinese students. With such a high proportion, the label "Chinese class" is likely to pop up. "It's hard to tell what the advantages and disadvantages are from it," said Cheng Ying, director of the Qingdao Branch of the US Department of Education International Cooperation program. "Nowadays, Chinese can be found almost everywhere in the world. No wonder they meet more Chinese faces in overseas classes." Statistics released by the Ministry of Education show that the number of Chinese students overseas soared to 285,000 in 2010, a 24 percent increase from 2009. China "exports" more students than any other country. "With China's continuing fast development, more and more Chinese families are able to pay the sky-high overseas study fees," Cheng said. "Meantime, the financial crisis still shrouds the economy of the Western world. More overseas universities are opening their arms to Chinese students by expanding enrollment quotas and loosening overseas study policies to stimulate their gloomy economies." Add in the high school graduates who prefer to skip China's fierce national college entrance examination and to study overseas instead. 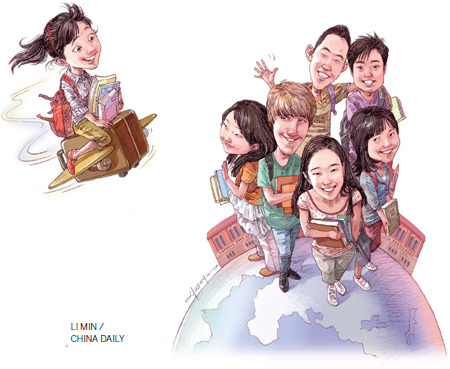 The 2011 Census on Chinese Overseas Students showed that 20 percent of the students who plan to go abroad are high school students. And a 2010 survey by the Education International Cooperation Group of 7,500 high school students in several big cities indicated more than 13 percent planned to seek overseas study, a 10 percent increase from the previous year. Cheng said most high school students still have difficulty in foreign language study, so the majority attend language school for at least a year. The courses are designed for non-native speakers, so a high proportion of Chinese students is inevitable. Feng Yunlong suggests another reason for the concentration of Chinese students in some classes: "Students and parents are likely to follow the crowd." Feng is a senior overseas study researcher at New Oriental Vision Overseas Consulting Co, an overseas education agency in Beijing. "Take the United States, for instance. A majority of Chinese students latch on to studying business and engineering courses," he said. Then they limit their choices to a few universities in the American Northeast or West because their relatives and friends in China know about their good reputations. With that kind of intense filtering, Feng said, people should not be surprised at the formation of "Chinese classes". "As far as I know, our school has a strict proportion for international students, and the ceiling is 10 percent. So do other good-reputation schools," said Yang Li, 24, of Beijing. "I've been in the London School of Economics and Political Science for three years, and only have two Chinese classmates, one from Hubei, the other from Hong Kong." "Chinese classes" are more common in lower-ranking colleges and universities, Yang said, because it's easier to get into them. Relatively few students receive offers from the world's top-ranked universities. "Being the No 1 university in Australia, we've never had the situation of having many Chinese in the same class," said Ye Zhengdao, professor of linguistics at Australian National University, Canberra. "I can only say we have more Chinese students than before, but they still account for a small proportion. Actually, we are now still working out methods to appeal to more Chinese elite students to study at our university." "Chinese classes" are likely to develop through the increasingly frequent cooperation between domestic and foreign universities. They also might occur if schools pay a bounty to some education agents for each student they recruit, experts said. Are "Chinese classes" helpful or harmful? Chen Hua, deputy general manager of Weijiu Education, a large overseas education agency in Beijing, leans toward helpful but with a caution. "When students begin a totally new life in an alien country, they will definitely meet a series of difficulties, like living habits, communication barriers and cultural differences. They often feel especially lonely and have the strong desire to make new friends," Chen said. "If they have Chinese classmates beside them at that time, their loneliness and helplessness will disappear quickly. They'll pass the toughest first two or three transitional months easily. "However, if they make friends only within the scope of the Chinese during the first couple of months, their overseas life may be engaged only in that small circle," Chen said. "It will be hard to make friends with local people, which is bad for language learning and immersion into a foreign culture." "To most students, one of the aims of studying abroad is seeking a foreign language atmosphere," said Zhao Cong, who is from Harbin, Northeast China's Heilongjiang province, and who just graduated from Royal Melbourne Institute of Technology. "But Chinese students like to stay together and communicate with each other in Chinese. It's really harmful for practicing a foreign language, hearing and speaking." The number of Chinese students who studied abroad between 1978 and 2010 totaled 1.91 million, the Ministry of Human Resources and Social Security reported this month. Nearly one-third of them returned to China over the same period. "In some sense, to study abroad is also a kind of investment," said Li Yingxian, manager of Beijing Dingsheng Culture Spreading Co Ltd, an advertising company. "Why do companies offer much higher salaries to those who return from overseas? The most valuable selling points are their international education background, way of thinking, people network, working experience and foreign language fluency. "Of course, these achievements depend on an individual's efforts in studying," Li said. "But I am sure, if someone always stays within the circle of 'Chinese classes,' his international level will definitely be reduced. Not all those who return from overseas are talented individuals." Zheng Lili is an editor of China Kids English Journal, a Beijing-based publication for 5- to 13-year-olds. "I've never gotten the chance to be abroad and I admire those who have returned. But a friend of mine changed my idea. "She went abroad after finishing high school. I met her during this year's classmates gathering in February. I thought she would speak English fluently with a genuine British accent, but to my disappointment she speaks no better than I," Zheng said. "From talking to her, I learned that she studies in a university that we never heard of before and in a class where 90 percent of the students come from China . . . Luckily she hasn't accomplished nothing, for at least she can speak Cantonese pretty well now and manages to understand Cantonese channels and films without reading the Chinese subtitles." Sun Nini, also from Harbin, is enrolled in a translation and interpretation studies program at Macquarie University in Australia. All her classmates are Chinese, but she said she speaks English as fluently as native speakers and has many non-Chinese friends. "In fact, not only Chinese, but students from other parts of Asia also like to be together," she said by phone. "It's no excuse for someone who couldn't learn English well. "During my first year here, I also had that concern. But gradually I learned that if you do not speak and show your hospitality to foreigners, even if you are surrounded by foreigners you are still a loser. People's character and efforts weigh more than the environment."